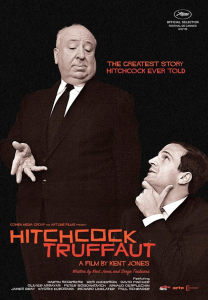 Kent Jones’s documentary Hitchcock/Truffaut is based around an interview filmmaker Francois Truffaut conducted with Alfred Hitchcock (which turned into a famous book of the same name) back in 1962. Reaching out to the master-of-suspense via fan letters, the young Truffaut managed to corral a very cordial and flattered Hitchcock to a sit down for eight days at Hitch’s offices at Universal Studios. This movie, shows many great candid stills from that conversation, while keeping a running commentary of the actual interview from the notes, is also interspersed with current interviews about both filmmakers from Wes Anderson, Paul Schrader, Martin Scorsese, David Fincher, Arnaud Desplechin and Olivier Assayas. What is quickly apparent is how much affection Hitchcock and Truffaut have for one another as well as how serious they take their work. Truffaut’s book of these conversations has been regarded for decades as a seminal work of the art of movie making-and he produced quite a few updated versions of it-revealing an unguarded Hitchcock very specific on how he shot his films (and pretty much addressing film by film) and Truffaut bouncing his own ideas off the master. This is rich stuff, two supremely talented artisans expounding on their work, enamored of one another and obviously so enjoying the time they spent together. Jones’s documentary is a delightful film.